Hydroseeders are widely used in highway slope protection, embankment biological protection and large-scale greenfield reconstruction. 1. Before you start, first clear the slope. Usually using tools to remove gravel, pumice, dangerous rock to make it flat. 2. Bolt selection bolt length of about 1-2m. Its function is two fixed slopes, easy to hang the net. If the slope is too steep, it is hanging beams. 4. Use a hydroseed sale of the sprayed substrate mixture. Spray from front: from top to bottom, from left to right. Avoid spraying from bottom to top. Finally spray the mixture of soil, pulp or wood fiber, water retaining agent, adhesive, and weeds. Thickness of about 0.5-25px or so. 6. Maintenance management: the main work for the spray, irrigation, fertilization and pest control. 7. Nonwovens Nonwovens. 10-20 days later, the grass appears on the slope, if the non-woven non-degradation, with artificial methods to open non-woven, is conducive to plant growth. 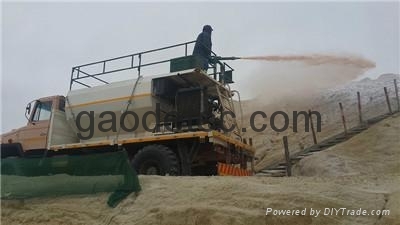 For more information hydro seeder equipment, please email us: info@gaodetec.com.